Providing collective-cosmic platform to international students of 50+ countries to represent heritage, achievements and celebrations of their respective country, Lovely Professional University has been organizing its annual two-day international fest “One World”. On the inaugural day 12 Ambassadors and Diplomats from 8 Nations witnessed the premier celebrations of the fest. The esteemed guests not only appreciated lively cultural presentations about their own countries but also danced upon the favourite rhythmic beats of other countries, particularly for Bhangra dhol-beats of Punjab (India). This year, the 9th edition of the fest is primarily on the theme of "International Trade, Commerce & Industry". His Excellency Ambassador of the Republic of Zimbabwe in India Mr Maxwell Ranga; High Commissioner of the United Republic of Tanzania Mr Baraka H. Luvanda; Deputy Chief of Mission Mr Ahmad Shoaib Habibi and Education Attache Mr Sediqullah Sahar from Islamic Republic of Afghanistan; Ambassador Mr Kondi Mani from Togo; Ambassador Mr. George C Mkondiwa from the Republic of Malawi; Her Excellency Ambassador Ms Ebyan Mohamed Salah and Education Attache Ms Amal Mohamed Said from the Federal Republic of Somalia; Ambassador Ms Mossi Nyamale Rosette and Protocol Officer Mr Moket Kakudji Germain from the Democratic Republic of Congo; and, Ambassador Ms Asmaa Abdullah Hassan Al-Shatter and Ms Om Alkhair Abdullah Ahmed Al-saaidi from the Republic of Yemen jointly inaugurated the international cultural extravaganza along with LPU Chancellor Mr Ashok Mittal & Pro Chancellor Mrs Rashmi Mittal at the campus, today. Upholding the great notion that festivals promote diversity, increase creativity, and make the world a better place to live in; the fest was flagged off for 4 kilo-meter long colourful cultural procession, which comprised 100+ international and national tableaus. 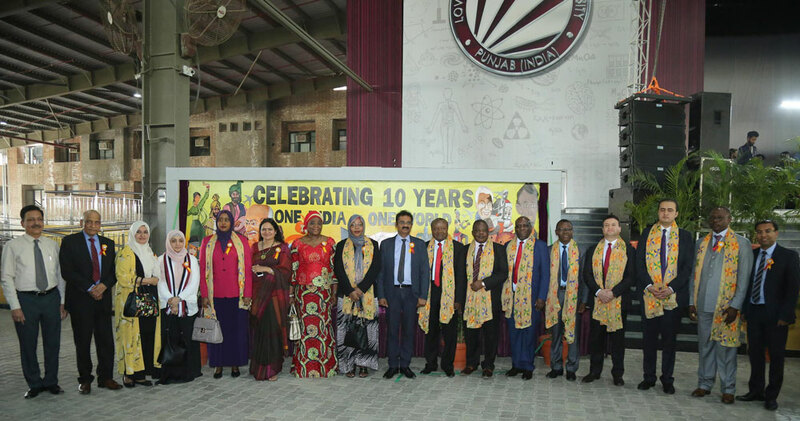 Showcasing cultural inheritance of their respective country and maintaining global unity, Indian students, too, participated along with their International counterparts in enormous celebrations. All of them were seen dancing and singing throughout the procession and working together for allied endeavours. Celebrating the theme of the year, students were holding placards with slogans related to various festivities, trades, industry and businesses with respect to their country. International students were also seen with particular dresses, ornaments and other attributes of their country. Continuing years’ of celebrations at the Baldev Raj Mittal Unipolis arena through 70 exhibition stalls, 3000+ international students mesmerized 30000+ spectators and audiences on the inaugural showcasing. LPU Chancellor Mr Ashok Mittal informs that international students at LPU are always inspired every year to celebrate this annual mega-fest by showcasing and sharing their cultures and values with students of other countries. Celebrated under separate theme every year, this celebration helps students in establishing great bonds of unity in diversity, making global understanding, attaining universal brotherhood for a peaceful co-existence in the world.